Anyone in America who drives a car is probably happy to see crashing oil prices translate to falling gasoline prices. WTI crude oil has gone from above $US100/barrel this summer all the way down to around $US76/barrel this week. While the economy is likely to benefit from improved consumer sentiment, low oil prices also come with negative effects. Specifically, if prices get too low, then energy companies won’t be able to cover the cost of production in the US. This spending by energy companies, also known as capital expenditures, is responsible for a lot of jobs. Wall Street’s economists and stock market strategists have argued that the next leg of the recovery and bull market would be fuelled by a boom in capex across US businesses. 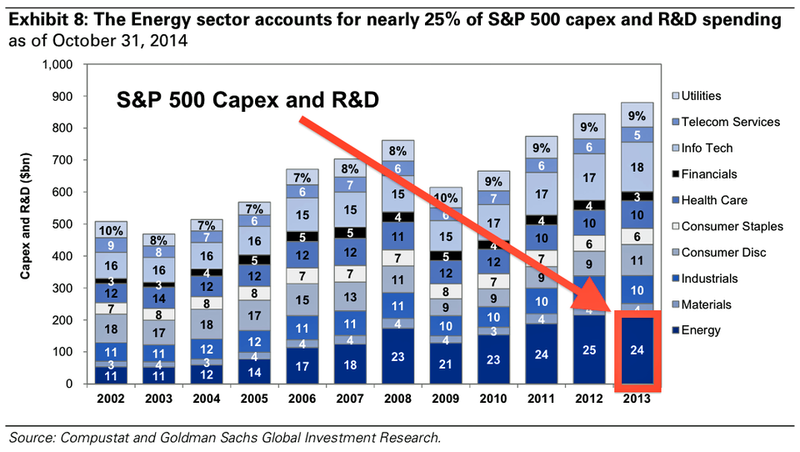 So a slowdown in energy industry spending could mean trouble. 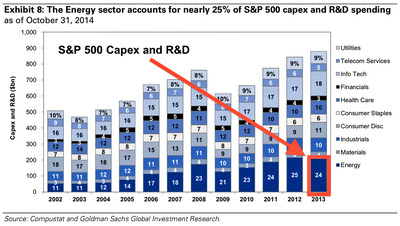 Goldman, however, is optimistic that we won’t experience a worst-case scenario.